I like the designs of the modern dollhouses pictured above. All of these dollhouses were built from loose build-it-yourself Sunset plans. I'm gonna see if I can talk someone into building a 1:12 version of the 1:6 house with elevator. I rediscovered these dollhouses while "cleaning". Somehow I never did finish. 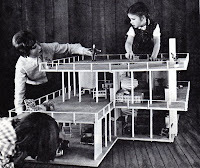 It's interesting that you can only seem to find 1950's - 1970's do-it-yourself modern dollhouse plans. 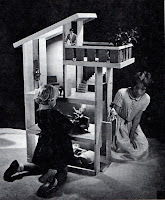 There is also one dollhouse plan from the 1980's that I know of. It surprises me that despite the increased desire for modern design and diy projects, etc, that someone hasn't currently been pushing dollhouse plans that would appeal to the modernist/minimalist crowd of today. Wow! I would love to have one of those in 1/12th scale! Do you still have the plans? If you do, could you send me scans of the plans (if you have a scanner) through email? Unfortunately, I only have the digital images. I often see the book for about $8 on ebay all the time. I have these in a book at home! I used to drool over them when growing up. I think the book only has photos, not plans but I'll check! I could probably help you convert that to 1:12 scale. I have a carpenter friend who is interested in building a scaled home, and he has CAD experience too, regarding Do it yourself plans. Between he and I, I'm sure we could come up with some pretty cool plans for the end user. Now we just need some feedback, as to what your readers would like to see in these houses, and how much they plan to spend. Thanks! I found one on ebay. If you had the plans for the house, since they are barbie size, you could divide the measurements in half to get a 1/12 scale house. Good old eBay. You should get some kind of referral bonus. I picked up a copy there as well. LOVE these photos. I'll add these to my growing list of future designs. i bought this for about $3 from amazon last year. Hi, I know this is an ancient post but I've been searching for the plans for the bottom dollhouse (with the elevator) for quite some time. My grandfather made it for my sister and I and I'm pretty sure it was late 60's or a few years before '74 since I was too old for Barbies by then and I remember playing for a couple of years with it. It got water damage and eventually fell apart but I would love to recreate it! So my question is, do you think the Sunset book (or magazine?) re-printed the plans after the original? For example, if I find the Things to Make Children book from, say '69 that it would have the same dollhouse? Or, all these years later, do you (or others in this thread) have the plans that you could sell me? I believe I have a copy. Let me look around for it and get back to you via email. I won't "sell" it to you. Digital copies run cheap. If I can't find my copy, I'll send out an SOS. Have two young granddaughters that have been asking for a dollhouse. I've been looking at the plethora of Victorian gingerbread but can't seem to get inspired. WOW! then I came across this blog with the pics of this dollhouse at the bottom of your article.... Just jumped out at me as maybe something Frank Lloyd Wright inspired.... just excellent clean, simple bold lines. If there is anyway I too could bribe a cc of this design from someone I know I would have two extremely excited granddaughters... I would be happy to cover any cost relative to obtaining the cc. There are a few copies of this book on Amazon. It also shows up on ebay from time to time. The cost is usually $3- $4. Let me know if you have trouble finding a copy.